There's abundant evidence that exercise and eating right can help prevent people from getting cancer. The latest information shows that exercise for cancer patients can also keep cancer from recurring. Several recent studies suggest that higher levels of physical activity are associated with a reduced risk of the cancer coming back, and longer survival after cancer diagnosis. Every person's situation is different. Before starting a moderate to vigorous exercise program, see your doctor. Flexibility exercises (stretching). Virtually everyone can do flexibility exercises. "Stretching is important to keep moving, to maintain mobility." If you're not yet ready for more vigorous exercise, you should at least stay flexible. Aerobic exercise, such as brisk walking, jogging, and swimming burns calories and helps you lose weight. Aerobic exercise also builds cardiovascular fitness, which lowers the risk of heart attack, stroke, and diabetes. Resistance training (lifting weights or isometric exercise) builds muscle. Many people lose muscle, but gain fat, through cancer treatment. For those with a high fat-to-lean mass ratio, "resistance training can be especially helpful”. An exercise specialist can help design the right program for you. Seek someone certified. When should you start exercising after cancer diagnosis and treatment? "As soon as possible”. Studies show that after a cancer diagnosis, people slow down. Stress, depression, and feeling sick or fatigued from cancer or its treatment tend to make people less active. The problem is, most people stay sedentary after treatment. As a long-term solution to the problem of fatigue, taking it easy and avoiding activity is not a good solution. 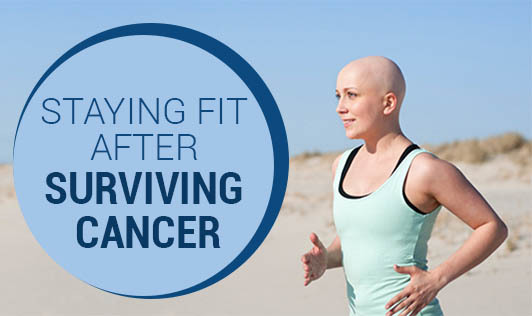 It is important for cancer survivors to get back to exercising to help their recovery. In other words, if you've downshifted your activity level since your cancer diagnosis, now is the time to rev back up.